Well folks, the holiday season is upon us and that means one thing. Cooking, baking, parties and cleaning. I think we all enjoy the first three in that category...but it is the cleaning that presents a challenge. Whenever guests come to my house I clean before they arrive and then I will clean after they leave. Have you ever noticed that cleaning up after people leave is more work than the cleaning before they come? I do!!! Especially if the guests have small children. I think another huge part of cleaning comes into play when you cook and bake. How many of you have a grease-splattered stove? My hand is raised here. My husband loves to cook and unfortunately, he is not the greatest when it comes to cleaning up afterwards. We both cook, but I am the main cleaner afterwards. So, if you are looking for a product to help you tackle your greasy messes and cleaning challenges than listen up! I have a product to introduce to you today that you are going to LOVE!!! 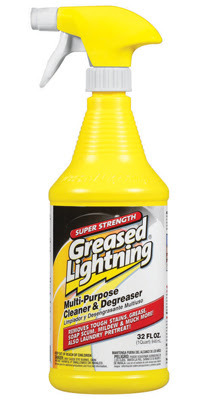 Greased Lightning is a multi-purposed cleaner that is powerful enough to use on mildew, soap scum and the tough grease that gathers on your stove and microwave. The Greased Lightning family of super-strength degreaser products tackle today's cleaning needs. Our multi-purpose products can be used throughout the home and beyond - from kitchens and bathrooms to garages and patios. Since the launch of our flagship product in 1985, we have worked to create innovative cleaning products based on feedback we gain from you, our customers. Our products are developed with you in mind and are designed to provide superior cleaning and degreasing power to help save you valuable time and money. What I really love about Greased Lightning is that I can use it basically anywhere. It is hard to find a product that is suitable for the kitchen and the living room carpets too. Can you see the mess I have to clean up here? Yeah...exciting. So, I first removed the knobs and sprayed the surface down with my Greased Lightning. When it came to cleaning it and wiping it down I wore rubber gloves to protect my skin. It isn't necessary, but recommended. It is also recommended that you ventilate the area in which you are working. I used paper towels to clean up as I wanted to test the strength of the cleaner. If it was a GOOD cleaner, it would come right up with little scrubbing. If not, I would have to use a stronger cloth. This next picture is from ONE SWIPE over part of the surface...look at how black it is!!! It definitely looks MUCH better, don't you think? I was really happy with how it turned out. To clean the knobs I simply put them in the sink, sprayed them with Greased Lightning and then wiped them down with paper towels. The grease came right off effortlessly. WOW. As you can probably imagine, I am in love. Yes, this is my new number one cleaner for the kitchen. I have not tried it in other areas of the house but am looking forward to doing so soon. Greased Lightning can be purchased at major retailers, hardware stores and do-it-yourself stores across the country. The average retail price is $4-$5. So, in my opinion...Greased Lightning is a wonderful product. My stove looks so great and the hardened grease came up so easily. I was impressed that I was able to use paper towels and not scouring pads or tougher cloths. I would definitely recommend this product to anyone looking for the perfect cleaner for this holiday season. No hostess should be without it! You won't be disappointed with Greased Lightning's performance!! Tell me your most trusted cleaning tip for the holiday season. :) You do not have to be a blogger to enter, but you must have a valid email where you can be reached should you win. If you do not leave an email address, it must be where I can easily find it. This giveaway is open to US residents (lower 48 states only) and will end 12/22 at 11:59 pm EST. The winner will be chosen using random.org and will be notified by email. The winner will have 48 hours to respond, or another winner will be selected. 1. "Like" Greased Lightning on Facebook. 2 entries, so 2 comments. Disclaimer: I received no monetary compensation for this post. I did receive a full-sized bottle of Greased Lighting for review purposes. All quotes and stock photos are from the Greased Lightning website and email. Prize is being mailed by myself. All thoughts and opinions are 100% mine. Add white vinegar to your laundry and the colors will never fade! Thanks so much for the fantastic giveaway! I like Greased Lightening on Facebook as Renee Walters! Thanks so much for the fantastic giveaway! I make a thick paste of baking soda and water to clean my sinks and bathtub. I commented on Purex Triple Action Detergent Review. My cleaning tip to keep the kitchen clean is to clean up as you go along. The best tip I have is to put a plastic bag under your tree before covering it. For stains on carpet sprinkle with baking soda, then add just enough vinegar to damping. Let it foam and rest for about 10 min. Then sponge up, follow by the vaccum. clean as you go, dont let it pile up because it is than rather overwhelming. Always catch the mess before it gets worse...i.e...scrub the dishes right after they get off the burners instead of saving them for later when everything's caked on. Clean as you go. It's so much more manageable than staring at an overwhelming mess later. my most trusted cleaning tip is, clean it up right away when it happens, dont let it sit and dry and harden... takes more time to clean it up..
i just liked them on FB!!!!!! stay on top of messes, they add up so quickly! To clean my microwave, I boil a cup of water in the microwave, and then let it sit in there about five minutes afterwards to "steam clean", and then I wipe it all up much easier. I "Like" Greased Lightning on Facebook. I clean as I make messes. Lemon/lime juice and salt on a burnt pot. Try to stay organized...if you stay organized then cleaning up is much much easier. Clean a little daily so it's not overwhelming.